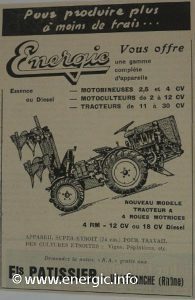 Energic 4 RM 12/18 tracteur brochure 1962. Engine/Moteur. 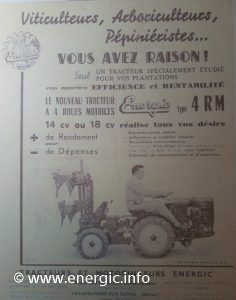 Sachs Diesel 604cc, 12 cv, mono cylinder 4 stroke, 4 wheel drive. Alésage 88 mm x Course 100 mm. 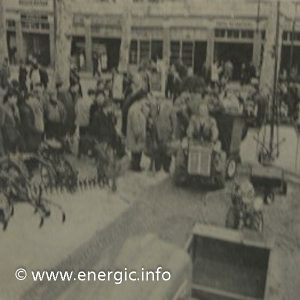 Read more about Sachs engine/moteurs in Energic tracteurs/motoculteurs here. Dimensions. Width min., 0.74m, length 2.4m, height bonnet 0.98m, seat height 0.85m. Transmission. Direct to the front wheels to the gear box/pont, with a lockable differential. Wheels. Front 650 x 16, rear 500 x 12. Weight 930kgs. Fuel tank capacity. 11 ltr.+ Fuel filters. Consummation. 1 liter per hour. 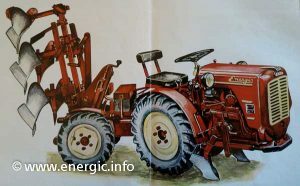 Energic 4 RM tracteur Sachs diesel. Air filter. In a bath of oil. Clutch. Dry single disc type. Gears. 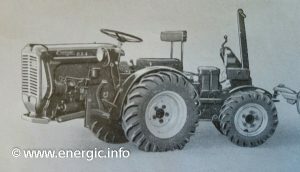 6 speed forward, 3 speed reverse, steering pivot within the wheels, maximum 60 degrees giving a turning circle just 1.30 meters. 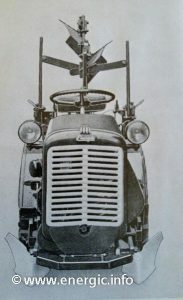 Drive direct to the front wheels, with a connecting shaft to the rear wheels. Speed in gears. 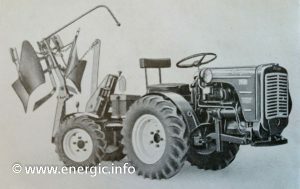 1 – gear 2.695km/h, 2 – 4.578km/h, 3 – 5.390km/h, 4- 7.843km/h, 5- 13.325km/h, 6 – 15.685km/h. 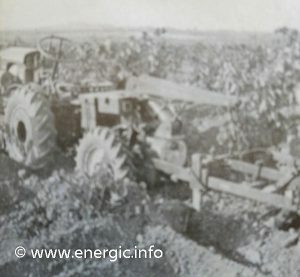 Energic demonstration 4RM 18/12 tracteur range in the vines. Rear lift. 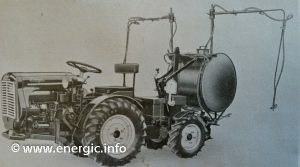 Hydraulic system available with cylinder lifting force of 4 tons (operated by a switch on the dash board). Multi functional rear couplings from trailers to equipment. PTO. Forward PTO’s options operated directly from the gear box. 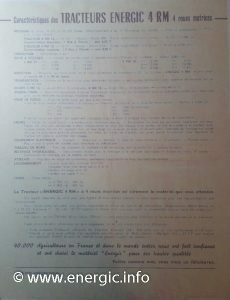 There was also the option of a intermediate PTO. 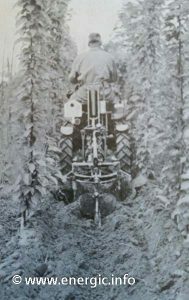 The third PTO was situated at the rear. 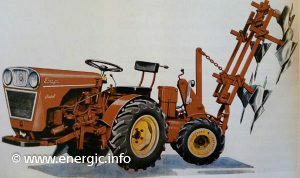 The PTO was available in all 9 gears to a max. @ 2000 t/m. 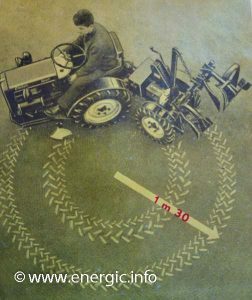 With the tracteur moving;1st gear 270 turns/minute t/m, 2nd gear 372 t/m, 3rd gear 540 t/m, 4th gear 800 t/m, 5th gear 1080 t/m, 6th gear 1520 t/m. 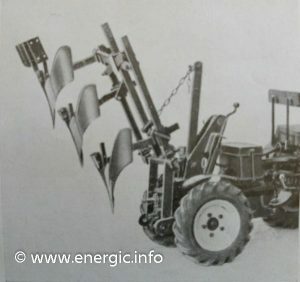 Tracteur stationary; 1st gear 790 t/m, 2nd gear 1085 t/m and 3rd gear 1580 t/m. Brakes. Front within the wheel drum brakes operated by foot lever, with hand operated brakes for each front wheel to help in maneuverability. Electrics. With dynamo, starter, battery 12v 50amps., lights front and back, and plug for trailers sockets. With dash board with all operating systems on it. Turning Circle. Only 1.30 min. with implements in tow! The steering is by wheel but pivots at 60 degrees for the articulation for min. turning circle of 1.30m. 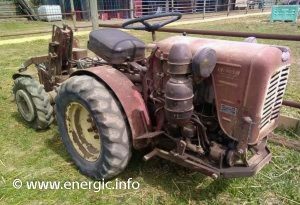 Energic tracteur RM12/18 cv only 1.30 m. min. with implements in tow! 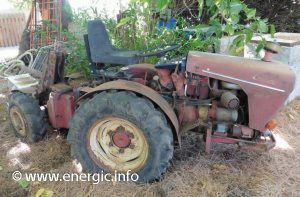 Energic tracteur RM12/18 cv only 1.30 m. with implements in tow! Seat. Height and pitch adjustment. 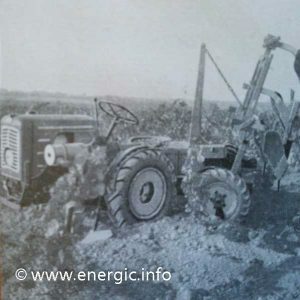 Energic 4RM12 tracteur Sachs diesel (second revision tracteur). 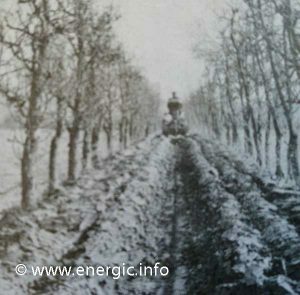 Other implements available;ploughs, cultivateurs, hoes, rotivator/fraise rotative, grass cutter/barre de corpe, poulie etc. 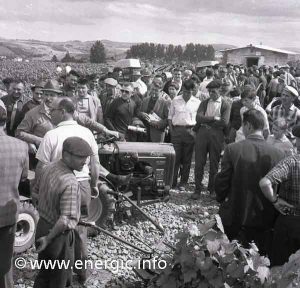 The unvieling of the 4RM 18 at the “lors du Comice Agricole de Juliénas (Rhone)” in 1962. by Ets Patissier director M. Nain. (frog eye type 4RM). 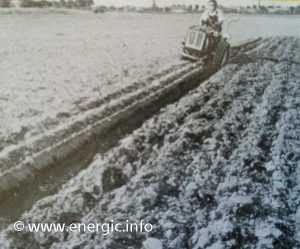 Read more about the Energic 4RM 18 here.